East Coast Hall of Famer, Larry Pope, and I had been hanging around Canaveral Pier earlier that morning. The surf was running about 2 feet. Larry wanted to take some pics of me and capture the morning's surface sparkle as a background. He suggested we drive down to Patrick Air Force Base and meet up at the break in front of the AP Shack. The only Patrick surf spots I knew were O'Club (not 1st light) and Patrick Pier. I wasn't sure where AP Shack was. Larry told me it was across from the 2nd traffic light. I asked, "Where?" He replied, "... just count the lights past Picnic Tables and pull in at the 2nd Light... the 2nd Light, just remember 2nd Light... What, are you hard of hearing?" We met there around 9:30am. The waves were mostly chest high with a little onshore breeze on it that created the diamond-like sparkles that Larry wanted as a backdrop. There was nobody out. Larry set up his camera and I paddled out to surf by myself for a couple of hours. The break is much the same now as it was then. Fun peaks on an incoming tide. The rights (in the middle of the break) were breaking perfect every set and walling up all the way to the reef section that forms the left at the north crossover. There it would become very hollow offering nice long cover-ups. 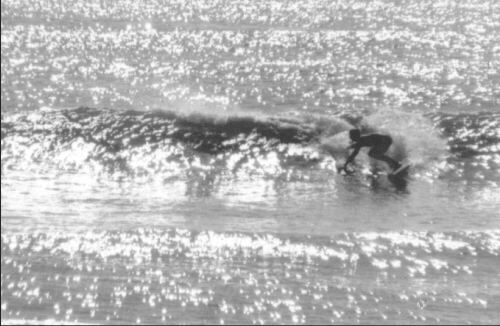 I was riding for Hansen Surfboards then and rode my 9'6" Hansen Competitor. The next day I took my friends Danny and Greg Hodge there and surfed it by ourselves. We arranged to meet at the 2nd Light. I give Larry Pope credit for naming the spot.